A couple of days ago we both happened to have a day off work, so what better way to spend some of it than pie making! Anyone who’s ever tried gluten free baking will know that getting the balance of ingredients right can be very difficult. Ending up with dry, heavy, crumbly or hard results is all too common. We think our pastry recipe is a winner, it’s short but holds together, it’s easy to work with, and it tastes great! Put the flour, almond milk powder and salt in a large bowl. Cut the fat into the bowl in chunks, and rub it in until it resembles breadcrumbs. Add the water, starting with 3 tbsps and mix well, the dough should be soft and slightly sticky. 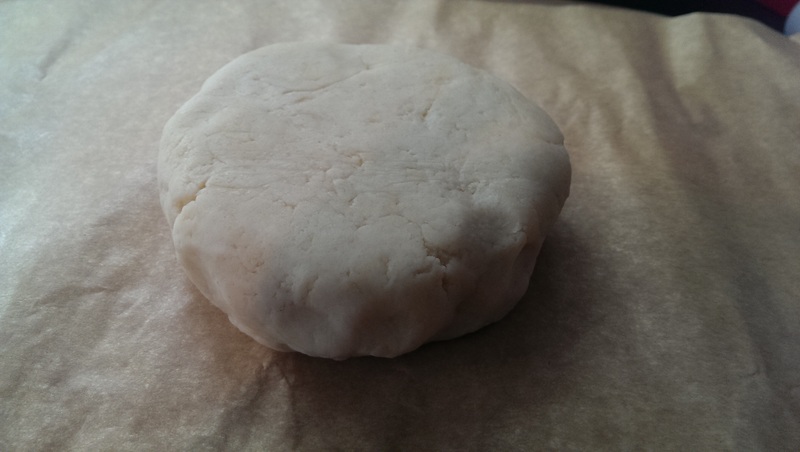 Wrap in clingfilm, and rest the pastry in the fridge for a minimum of 30 minutes. To use, dust your surface and rolling pin well with gluten free flour before rolling out. The pastry will stick if you don’t do this. This amount of pastry lined 12 10 cm pie tins, and topped 6 of them (the other 6 pies were topped with mash).